If you have a PayPal account you can use this. PayPal is widely used for online shopping and using this method means you don't need to type your bank or card details in to different websites when you make a payment, all you need is your email address and password. 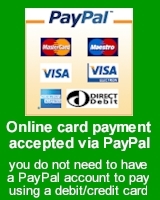 You can pay by credit or debit card via PayPal (you do not need a PayPal account to pay by card). Select the PayPal option at checkout and choose "pay by credit or debit card". All card processing will be done by PayPal and no card details will be stored on this site. If you do not wish to enter your card details onto the internet, you can pay by card over the telephone during opening hours (9.30am to 4.30pm Mon-Fri and 9.30am to 3.00pm Sats). Choose this option if you wish to send a cheque (made payable to Nazeing Glass Works Limited). Delivery will be slower as the payment must clear before goods are sent (usually five to seven working days). For large orders, payments can be made direct into our bank account instead of sending a cheque. Please contact us for details.